When I graduated college in May of 2009, my immediate goal following that achievement was to pass the CPA exam. I didn’t start my full-time job until September so I had the entire summer to pass as many sections of the four-part exam as I could. It was a grueling process. I averaged 8 hours a day of study time, 7 days a week. Day after day, I would sit down at my computer, open the books and soak up as much information as I could. It took a lot of hard work but there was also a method to my madness. I used a program to keep me organized, I skipped over areas that I thought were a waste of time and I utilized outside help when needed. In summary, I worked smart AND hard. The combination of those two is what allowed me to pass the CPA exam. Fast forward a few years to when I decided to start The Quantify Group. Starting a business takes a ton of work but just working hard won’t get you there. You need a plan in place and you need to be efficient with your time. Again, work smart AND hard. 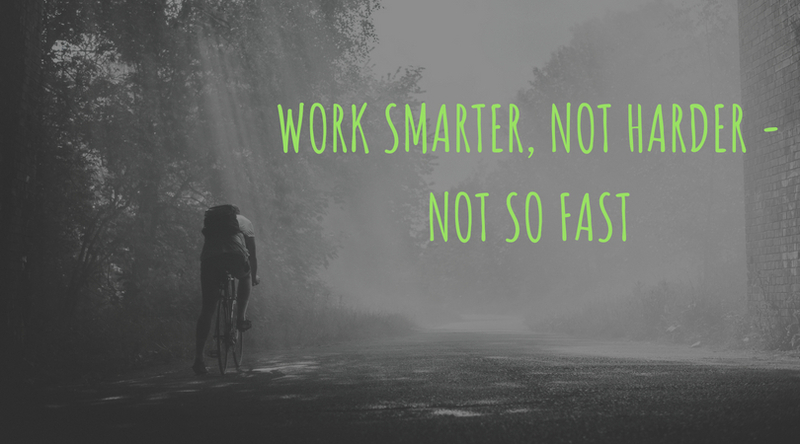 I am sure you hear this phrase “work smarter, not harder” all the time. Whether it is something in your professional or personal life, people echo this sentiment all the time. In fact, I am convinced that some people use this saying as an excuse to not work hard. I want to challenge you if you feel that this concept holds true for you. Just think of how unstoppable you could be if you combined working smart with hard work and determination.